Warning: This post, “That Time Santa Undermined Mom & Dad: Introcuding ‘Snowball'” may cause you to question my sanity. Don’t fret… I am already questioning it myself and seeking help. I don’t really know when it happened or how, but in November Chris and I actually started talking about it. We had a weekend without kids and headed to the best sushi restaurant known to mankind, and we talked for a while. I told him that I would be able to help her care for it, and I knew that she could handle a puppy. I said, “Let’s face it… our kids are 8 and 10, and they strongly still believe right now. This year may be the last that they both believe, with Sawyer headed to middle school next year. Let’s make it magical!” I pulled up some local rescue pups, and we started searching. However, I was concerned with the timing and working it all out. I reached out to my landlord at Sweet Clover, whose sister runs a local rescue, and asked if she knew of any puppies her sister might have. 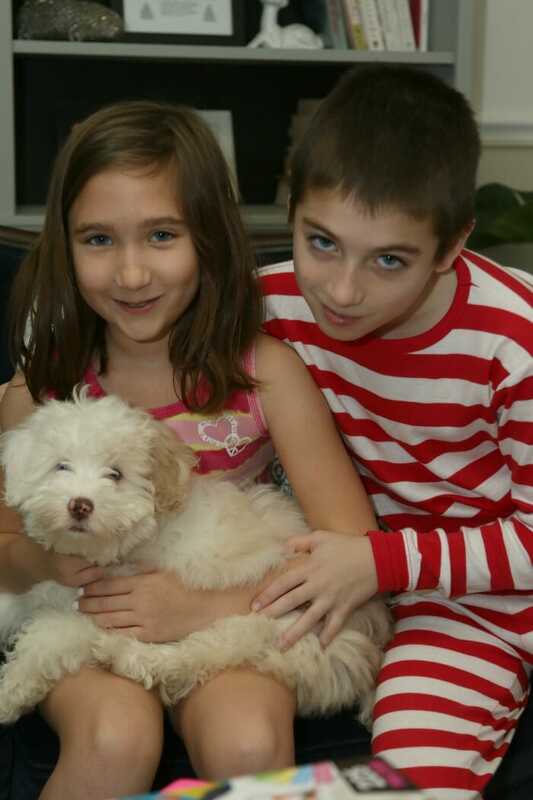 As luck would have it, they were about to head to Ohio to rescue a deaf female miniature schnoodle puppy. She was actually from a breeder, but because she was deaf unwanted by the breeder. Now, I had not considered a deaf puppy, but I knew that this would be a special girl needing special love, and I know Emmy’s heart. I knew that she would be the perfect girl for this puppy, and this puppy would be in good hands with Emmy. Because I was going through this rescue, I happened to know quite well the foster where the puppy would stay. She and her son were a huge part of all of this working out so well as they let me come to their house at 5:45 on Christmas morning to pick up the puppy and bring her home to surprise Emmy in time. I can not thank them enough for the great care they gave the pup, and for all of their help in making this a Christmas to remember. We told the kids that I was going for a Christmas morning run but would be back before they were even awake… I do this most mornings, so it was not behavior out of the ordinary. On Christmas Eve, after the kids went to bed, we placed the crate and puppy accessories (as well as Sawyer’s gifts) under the tree and on the fireplace. Merry christmas, my child. As you can see, I did not bring you anything that was on the Christmas list you mailed to me, but instead brought you the one gift that was written in your heart— a puppy of your own. This girl is no ordinary puppy. She is a special 10 week old furball that Mrs. claus and I rescued and saved just for you. She needs someone who has enough love in her heart to oversee her imperfections, and to provide her with selfless love, affection, and guidance. You see, Emmy, this sweet puppy can not hear- she is deaf. Because of that, she will require special training and special attention. It will be up to you to teach her sign language so that she can understand you, and so that you can communicate with her. I chose this home for her, because I know how big your heart is and how much love you have to give, and how much patience you will have for this puppy. And aside from her special needs, she is still a puppy and will also need you to play with her, take her for walks, and she really likes to chew! Why, on the ride here, she was trying to chew on the fur on my hat! I trust you, Emmy, and am happy to leave this sweet girl in your care. I know that you are a perfect match for one another, and will be the best of friends. As you can see, Emmy is over the moon in love, and has named her “Snowball.” We’ve learned the sign for snowball and will sign her name to her. We’ve been working with some basic sign language commands as well, and she seems to be starting to understand “Come.” This is the smallest dog we’ve ever owned as well as the first female dog we’ve ever owned. She is a little over 7 pounds now, and will only grow to be about 15-20 pounds we believe. Even with her handicap and small stature, she seems to be holding her own just fine. I am fairly certain that Catcher believes Santa brought her to him as he’s been having a blast playing with her. They steal each other’s toys, play tug of war, and battle it out playfully. Jake is not completely sure what is going on, but with her here, Catcher doesn’t bug him so much, so I think it’s a win for him. 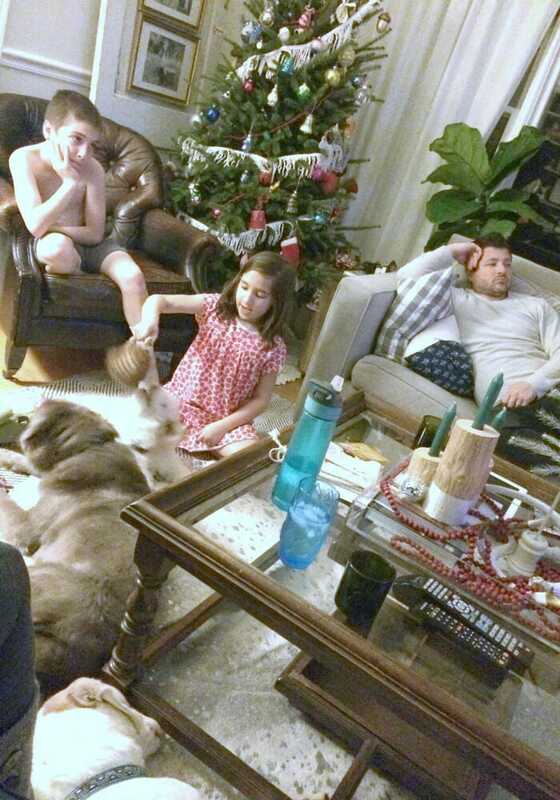 Life at our house pretty much looks like this right now: Jake resting by my feet, Emmy playing with Snowball, Catcher playing near them, and Sawyer and Chris lounging. So there you have it…. The magic of Santa undermined the practicality of Mom & Dad. And I wouldn’t trade it for the world because it was the most incredible Christmas morning ever. From our motley crew, we hope you had a Christmas full of magic, family & friends, furry friends and treats for everyone! Oh so perfect. This is such a precious and loving story. thank you so much, marty! happy new year! thank you so much, danielle! she is the sweetest, truly. What a wonderful and magical surprise! Snowball and Emmy are a perfect match. Merry Christmas Cassie! thank you so much, sharon! merry christmas and happy new year! i hope not, melissa! merry christmas and happy new year! He’s so adorable! What a lucky pup to find such a loving family! thank you so much, emy! she has one us all over with her sweet fluffy ways! Positive this Christmas will go down in the books as Emmy’s best one ever! Precious!! i sure hope so, dana! I barely made it through the first few lines before I started bawling. What a wonderful gift for Emmy and the entire family! You crafted a beautiful letter from Santa, and I’m so happy snowball has found the perfect family to grow up with. aaaaw, thank you so much, gail! Well that is basically the sweetest story EVER. You gave Emmy such a special Christmas that she will cherish in her heart forever. You are such an extraordinary mom! 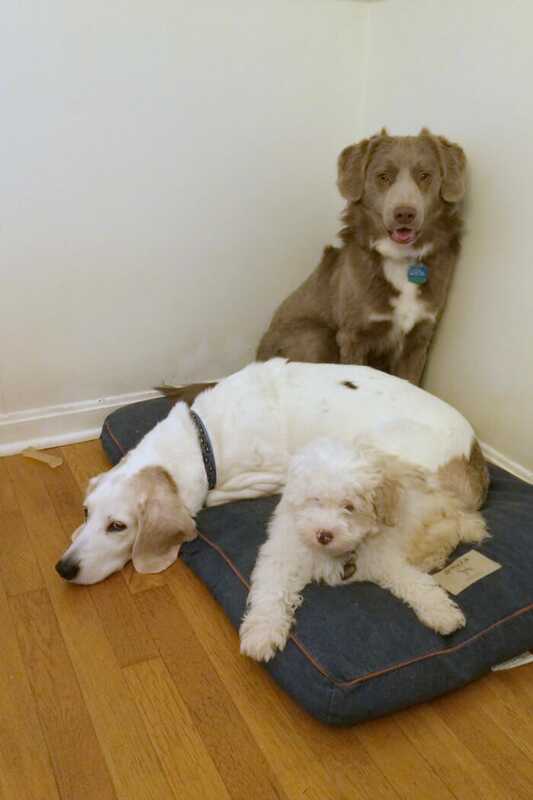 Snowball is such a lucky pup, and you are a lucky family to have all three sweet hounds. thank you so much, catherine! 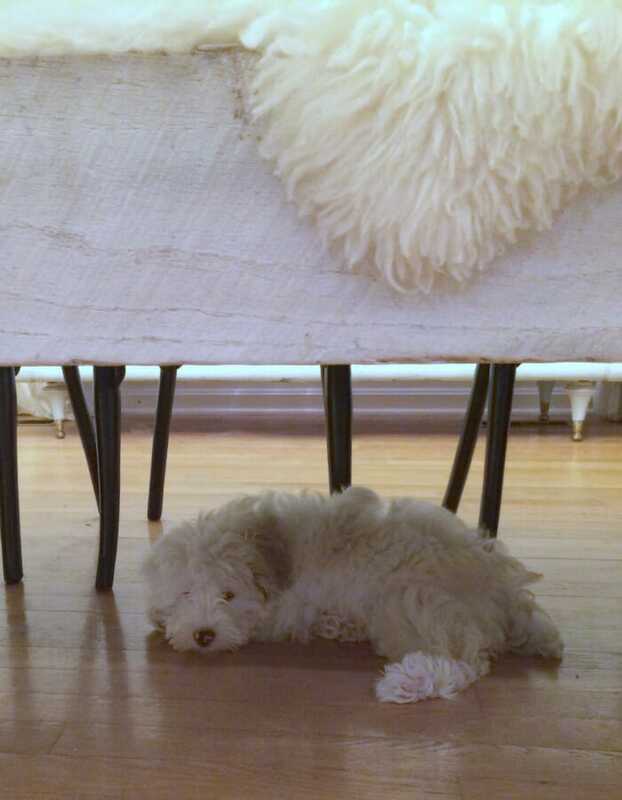 snowball is the sweetest- she truly is a little ball of love and fluff. How sweet! That made me tear up this morning!!! Can’t wait to see more of the adorable duo! she is seriously the cutest!!! we’re in love! Cassie, you gave the most loving gift ever imaginable. You are SANTA!!! thank you so much, patty. i know that one day when i explain to my kids the truth behind santa, i will be able to tell my kids why i did what i did and that i believe in the spirit of santa. Cassie, I first came to your blog because of your AMAZING style but I stay because of your heart. Thank you for sharing this story. It’s perfect. thank you so much, amanda- i felt the same about your blog and am so glad we’ve met! Reading about how a deaf dog learns will make for great posts, I’m looking forward to reading more. thank you- we have a lot to learn ourselves! The note totally made me tear up at work and I love that you helped preserve the magic of Christmas for her. I just convinced Kyle to let us have another dog and we brought her home right before Christmas. A house full of dogs is the best kind of house! i am so excited for you, too!!!! I’m deaf so let me know if you need any help with signs. And awww such a sweet story! What a wonderful story! Congratulations on the new addition to your family! As the former owner of a deaf dog and a hearing dog (sadly both crossed that Rainbow Bridge) I would give you the best tip ever of using your hearing dogs to help train your pup! She will pick up on what they do. Teach them the signs as well. You’ll be surprised at how fast they learn and your new Snowball will copy their behavior. Tell everyone to sit and give the sign….when the hearing dogs sit so will Snowball! Hope that is helpful and thanks for adopting a deaf dog! thank you so much- that is a great idea!!! You are a fabulous mother! That is one seriously adorable puppy! Santa’s letter had me tearing up :). We surprised the kids with a kitten one year–the kitten grew up to be kind of a grumpy cat who doesn’t seem to care for us that much ;)–but I’ll never forget how awesome that Christmas morning was! aaaw, i hope our outcome is better. 😉 i don’t need deaf and grumpy on my hands! snowball is such a cutie!!! what a thoughtful and perfect gift for Emmy! thank you, jessica! she is adorable! How wonderful, for all of you. Love this! What a sweet little fur ball – perfect name! Love her! You win parents of the year! haha! i don’t know about that- perhaps lunatics of the year? I always find myself crying while reading your posts 😀 What a beautiful gift. Not just receiving Snowball, but keeping their belief in Santa and the magic of Christmas alive. Snowball is in such good hands with Emmy and will no doubt receive the most pure love. What a great fit! Merry Christmas!!! aaaaw, i don’t set out to make you cry. i promise! We’ve found having a “hearing dog” in the house is also extremely helpful in training. So bringing her in to your home sounds perfect. Best if luck! yes! that was one of the sites we visited already and loved it! and we have two other hearing dogs so i am sure it will be great- thank you! Thank you so much for sharing this story. Rescuing and saving dogs is the way to go. Blessings to you and your family and Happy New Year. thank you, sally! happy new year! What an amazing Christmas for your beautiful, Emmy. 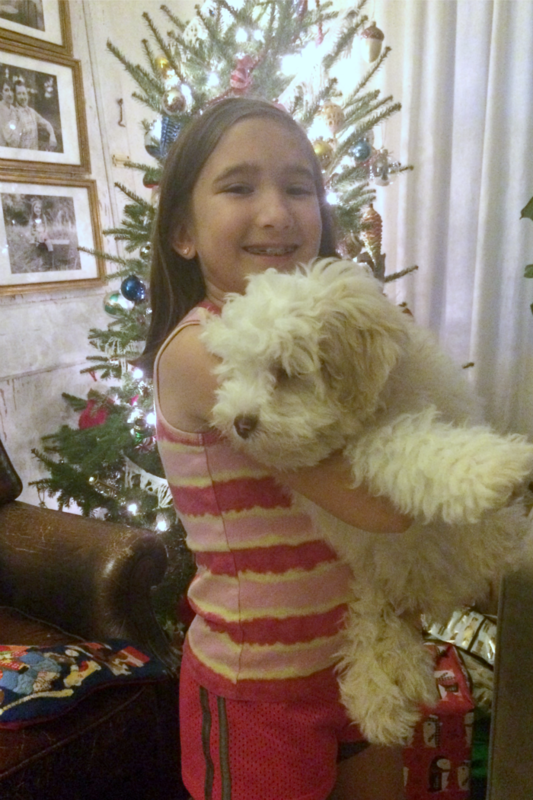 She is definitely the perfect match for snowball…certainly her best Christmas ever!! Wishing you and your family a wonderful new year!! thank you so much, kristy! it truly was! happy new year! Great story and glad Snowball is loved! 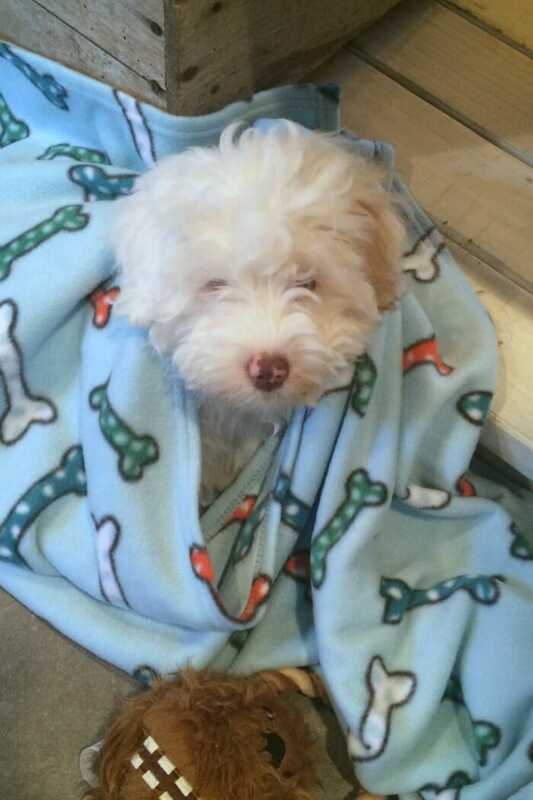 Well isn’t Snowball just the most adorable bundle of fur ever! I loved reading this whole tale and my heart is filled with joy for this sweet puppy and Emmy! she totally is the cutest thing ever- she’s hilarious, too! Such a great story. I love the little note from Santa.